Book of Mormon setting is spot on! Careful attention to scriptural detail is what makes Sister Olive’s setting the best fit for the Book of Mormon’s literary locale. It would be great if more Mormons paid attention to their scriptures instead of surrendering their wits to the pundits and tour guides of this or that “Book of Mormon geography” camp! We believe that the Book of Mormon “land of Zarahemla” near the coast of the “west sea”, simply has to be in the vicinity of Cumorah. The northern land of the Jaredites (including Cumorah and the hill Ramah) was so near to the land of Zarahemla that a search party sent out from the more southern land of Nephi mistook a locale in a “land among many waters” for Zarahemla. (Mosiah 8:7-8; 21:25-26) The Book of Mormon land of Zarahemla cannot possibly be thousands or even hundreds of miles from Cumorah’s land of many waters. 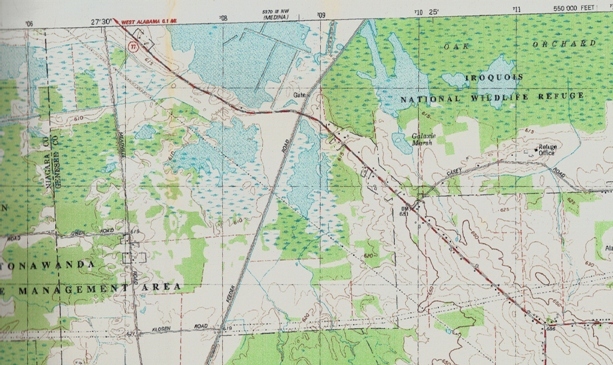 Sister Olive cites a noted archaeologist (William A. Ritchie) on the possibility of a native site in Iowa being related to a people who anciently inhabited New York; and the Mexican historian Veytia points out that migrating Native Americans had a propensity for naming new settlements after former ones. Could there have been an ancient site in Iowa with the Book of Mormon namesake? (Choice Above All Other Lands, Chapter Two) We shouldn't be surprised to discover the remains of Mound-builder cities and temples along the Mississippi. What if one of the reasons the Lord requested (or approved) that “the name of Zarahemla be named upon” one of the gathering places of the saints (LDS D&C 125:1-4), is simply because of the meaning of the ancient name? See In Search of the Meaning of "ZARAHEMLA" ; see also Zarahemla and a verse from Torah. The idea that a search party could start out from the South in search of the Iowa / Mississippi River coast, end up in western New York, and then think they had found Iowa is preposterous! 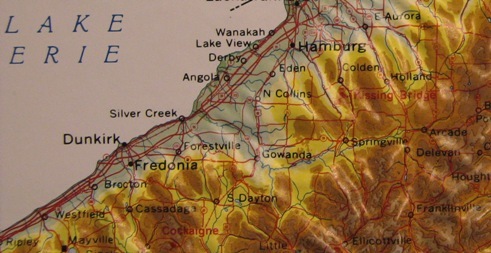 Principal Nephite lands situate near the northern Erie coast. 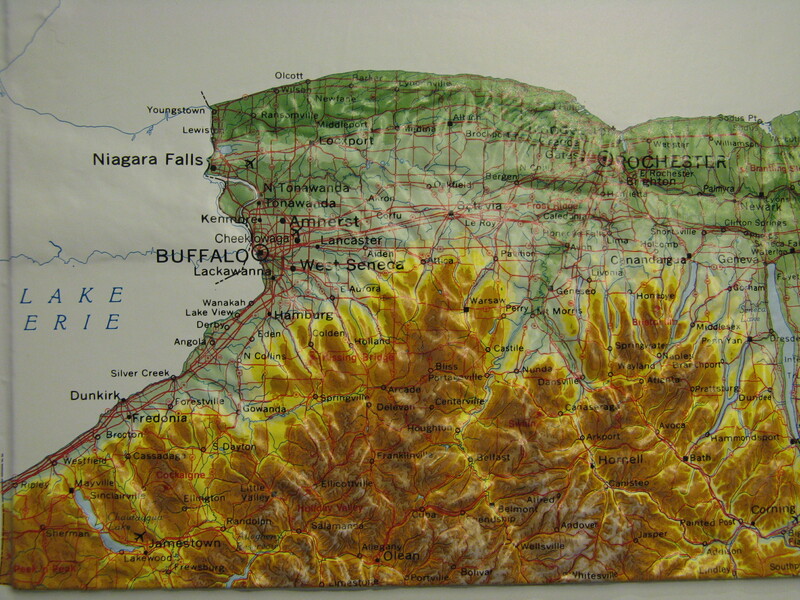 The Finger Lakes are eastern seas relative to the Nephite lands of Zarahemla and Bountiful. Anciently, there were even more lakes to the east of principal Nephite and Lamanite lands. 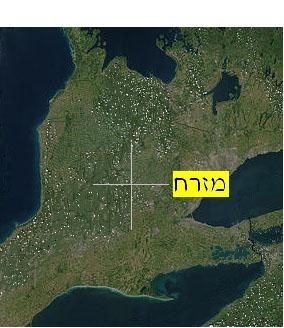 The eastern seas now called the Finger Lakes are a short distance southward from the Smith family farm in the land Cumorah. There really was a small land-bridge westward from scriptural Cumorah. Geologists know it today as the Batavia Moraine. 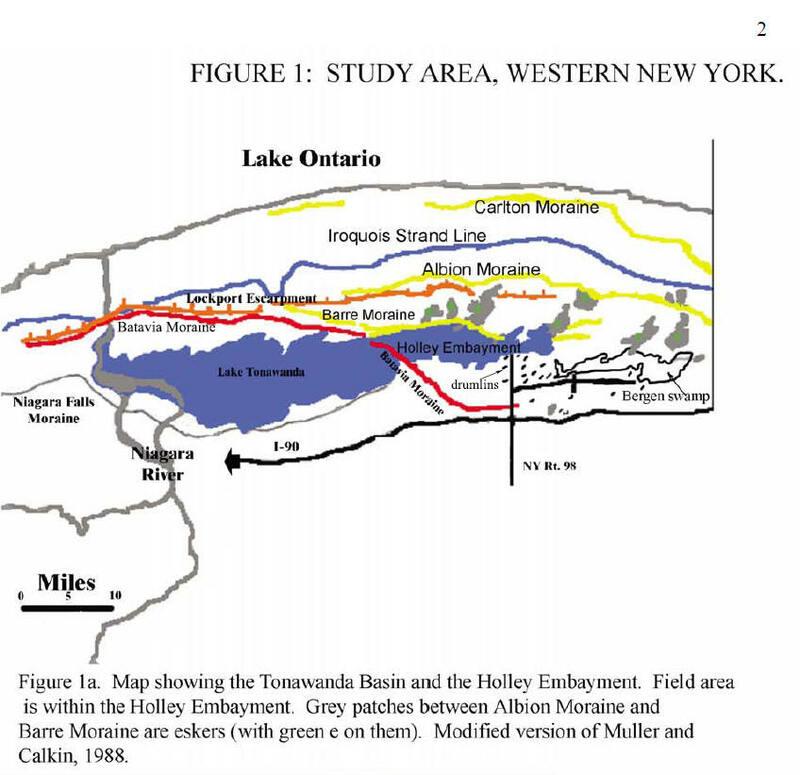 Unlike much bigger isthmuses which have water on the north and south (obtusely popularized by tour guides), the small and narrow, almost inconspicuous Batavia Moraine really did have a sea “on the west and on the east” of it - exactly as scripture describes! (Alma 50:34) In fact to this day there are wetlands nearby - remnants of an ancient inland sea called Tonawanda that extended from Lake Erie . The true “small neck of land” passing through the watery remnants of ancient Lake Tonawanda, along route 77 in western NY. Lake Tonawanda is “the sea” mentioned in Alma 50:34. This inland sea extended eastward for more than 70 kilometers from what is now the Niagara River . The almost inconspicuous “small neck of land”, “pass” or “passage” passing diagonally through what was ancient Lake Tonawanda (arm of Lake Erie) with water “on the west and on the east.” (Alma 22:32; 50:34) The ancient sea persisted till several centuries CE, and exists today as wetlands. Above is the approximate distance between Lake Erie on the west, and an eastern chain of ancient lakes that existed along northward flowing Tonawanda Creek, south of Batavia. 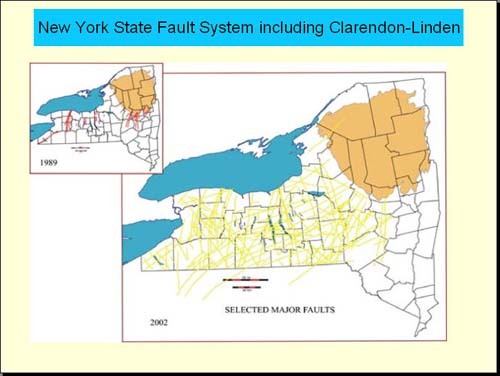 The line between Batavia and Lake Erie runs more or less parallel to the Onondaga Escarpment. It can be walked in ~1.5 days! Tonawanda Creek turns westward and spills over the Onondaga Escarpment at Indian Falls. 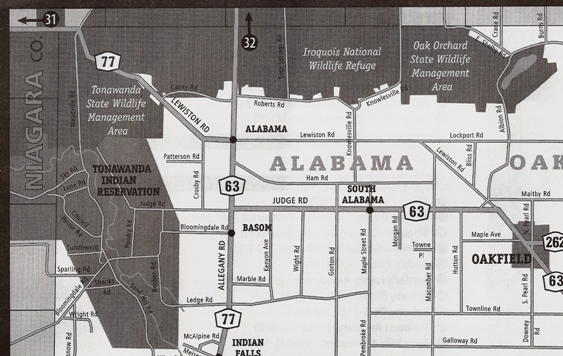 See Why Lake Erie, and not Lake Tonawanda, is the Western Terminus of the Land Bountiful. Tonawanda Creek spilling over the limestone capped Onondaga Escarpment at Indian Falls, not far from "a small neck of land" (the Batavia Moraine). There is a nice little restaurant at Indian Falls where you and a friend, or loved one can dine, while discussing the significance of where you are! The Lord sent missionaries in the early days of the Church to preach to the “Indian tribes in the West”, identified as Book of Mormon “Lamanites”, living near the shores of Lake Erie. (LDS D&C 32:1-2) It was from the coast of this west sea that Book of Mormon peoples “spread” after a period of drought in ancient times; as recorded in scripture. (Helaman 11:20) Scripture therefore indicates that the “west sea” was a source of freshwater. The principal lands of the Book of Mormon (Desolation, Bountiful, Zarahemla, Nephi and, yes, the land of first inheritance) are definitely not spread over the heartland of America but are so localized near the coast of the “west sea”, that inland elevation consistently rises as you journey south. This matches the terrain near Lake Erie perfectly. (Alma 22:27-33; 26:9, 23) It is one of the few regions in America where rivers flow northward – unlike the heartland. Though famous to Israelites, Kishon is not a mighty river like the Nile to the South or the Euphrates to the east, but is a famous local brook or river like the Nephite Sidon. That Sidon is a local river like the Kishon, is evidenced by the fact that it is the only river named in the Book of Mormon’s American setting. Of course there were other rivers; it’s just that the principal setting of the Book of Mormon, like the biblical land of Israel, is small. Thus the original Manti of the Book of Mormon, near the headwaters of Sidon, was not only at higher elevation than Zarahemla, it was near the body of water the Nephites called “the east sea”. (Alma 59:5-8; 50:13; 51:22-26) As for the location of Manti, here too scripture and verifiable statements by the Prophet Joseph Smith should be given far greater weight than apocryphal Mormon commentary. See for instance, the Much Ado About “Manti” in MO. Rochester Museum mural of the region where the Nephite “east sea” may have been - today reduced to marshland. Not to be confused with “the narrow pass” or “the narrow neck of land” , situated on the Desolation / Bountiful borders to the north (Alma 22:31-32; 50:34; 52:9; 63:5, Mormon 2:29; 3:5, Ether 10:19-21), the “narrow strip of wilderness” runs east to west, between the lands of Zarahemla and Nephi to the south. Here we find present day Zoar Valley Canyon in the Cattaraugus River Corridor. “Zoar” is a biblical place name meaning “small”. (Genesis 14:8) This name was given the locale by early colonists. It is particularly appropriate because “Zoar” (really pronounced “Tsoar”) is similar in spelling and sound to the Hebrew word “zar” or “tsar” (צר) translated “narrow” , “strait” and “enemy” in the Bible. (e.g. Numbers 22:26, Job 36:16; 6:23, 1 Nephi 21:19 or Isaiah 49:19) In Isaiah 59:19 the Hebrew word “tsar” may intend to evoke a “narrow” river, or an “enemy” invading like a torrent - or both! The elevated land Nephi is seen in the distance (looking south) from the Cattaraugus River Corridor – the “narrow strip of wilderness”. Zoar Valley Canyon in the Cattaraugus River Corridor, the “narrow strip of wilderness”. Sister Olive has picked the surroundings of Canandohta Lake in Pennsylvania for a possible site of the “land of pure water” called Helam. From Helam, it’s about a 12 day journey (old and young with livestock and belongings on foot) north to Zarahemla (perhaps near East Aurora). (Mosiah 24:25) Helam is 8 days south of the waters of Mormon which was near the site of the city of Lehi-Nephi. (Mosiah 23:3-4, 19) So the minimum distance (if you don’t get lost in tall forests) is only about 12 – 8 = 4 days journey directly between the heart of the land of Nephi and the land of Zarahemla. Sister Olive’s setting fits the scriptural math! When you pay attention to what is written, you realize that principal Book of Mormon lands were not spread over the western Hemisphere, or even over a large portion of North America. You may notice, as you study the Book of Mormon, that the “west sea” is not mentioned north of the Desolation / Bountiful borders. (Alma 63:5) Instead there are references to “the furthermost parts of the land northward” (3 Nephi 4:23) or “northernmost part of the land” (3 Nephi 7:12) as if northern lands come up against watery barriers. This, as you can see, fits both western New York and Ontario Canada! The more distant northern land (Ontario Canada) is bounded in each of the cardinal directions by inland seas (Helaman 3:8); but its sea on the west (“sea west”) is never called the “west sea”. The “west sea” is the name of the sea west of Zarahemla and Bountiful. The biblical expression “spread abroad upon all the earth”, can simply mean over a local land or region. (1 Samuel 30:16, Helaman 3:8) In this land northward, there are inland seas in each of the cardinal directions, exactly as scripture describes. While you’re in the vicinity of Cumorah, stop at the Rochester Museum of Science and view some of the artifacts on display. You don’t have to pay a tour guide to conduct you through sacred Book of Mormon and Church history sites. You can plan your own pilgrimage as my wife and I have done! We rented a car, brought along our GPS, and of course our scriptures. If you actually experience the land and the distances between sites, we think you will see that Sister Olive’s setting is scripturally spot on! Ask yourself, as you travel between sites, could it be so many days on foot (as scripture indicates) from here to there? Journeying from site to site, I think it will become evident to you just how preposterous larger proposed geographies are. Should we be at all surprised that the authentic land of the Book of Mormon is right where the work came forth – speaking to us, as it were, from the selfsame ground? (Mormon 8:23-26) All you have to do is accept the location of Cumorah, given in LDS D&C 128:20, and not flinch. Following scripture, details about the Promised Land fit into place! Ephraim George Squier was a member of the AMERICAN ETHNOLOGY SOCIETY, the NEW YORK HISTORICAL SOCIETY, and the HISTORICAL AND ANTIQUARIAN SOCIETY OF TENNESEE. His classic work, Aboriginal Monuments of the State of New York (A.M.S.NY) was published by the Smithsonian Institution in 1849. Native American artifacts of copper (including “copper arrow-heads”), brass and iron (iron axes) were recovered from Indian “bone-pits” which contained “a large number of skeletons”. Squire attributes the artifacts to both “modern and remote date”. The Book of Mormon mentions articles of copper, brass and iron. Similar metallic objects feature in nineteenth century literary works on the American Mound-builders. Of course, mainstream American History and Literature specialists do not regard the Book of Mormon as a work of ancient history. The fact that NY amateur excavators, “diggers” (like the youthful Joseph) were made aware of precisely these kinds of finds, is all that is needed to evince archaeological support for the literary locale of the Book of Mormon – set in Joseph Smith’s own country. In other words, archaeological support for the Book of Mormon’s setting is not the same as proof that the Book of Mormon comes from an ancient document. A similar relationship exits between the Bible and mainstream archaeology. Showing that an archaeological find fits the Bible's literary setting is one thing; arguing that a find proves the Bible to be completely historical, is quite another. Squier is willing to admit that some of the trench and timber ruins could be quite old, as long as no body tries to claim they are the works of some non-native lost race, e.g. Israelites. LDS scripture doesn’t totally disagree, in as much as the Book of Mormon teaches that the surviving Lamanites and the decimated Nephites were related. Few remains of the numerous and impressive earth and timber works that once dotted the New York l landscape are visible today. But they truly were there! Many of them, now lost, were surveyed and documented by respected authorities like E.G. Squier. The Native American sites were disappearing under the farmer’s axe and plow even in Squier’s day. So there is, or was, considerable archeological support for the Book of Mormon’s literary setting in western NY - in exactly the region LDS D&C 128:20 places Cumorah. Do Mormon affiliated tour guides and “Book of Mormon geography" groupies, who promote more exotic and spectacular locales, have ulterior motives when they tell people there’s no archaeological support for the Book of Mormon’s setting in western New York? Or are they just plain nescient? Doesn’t it make sense that God would place details in sacred scripture as a service to his covenant people Israel; whereby they could identify the covenant lands of their inheritance - if they did not treat what was written lightly?